The eldest of nine children, Marc Chagall was born in 1887 to a poor Jewish family in the small Russian village of Liozno near Vitebsk. At a young age, he began to study painting with a local artist and in 1907 moved to St. Petersburg. His paintings began to exhibit their characteristic use bright, vivid colours in creating a dreamlike atmosphere. 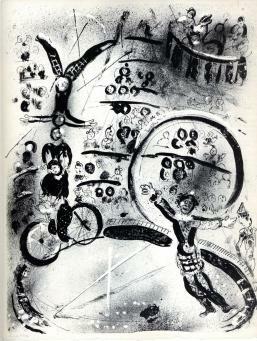 After establishing a local reputation, the artist moved to Paris in 190 and four year later had his first solo show in Berlin. 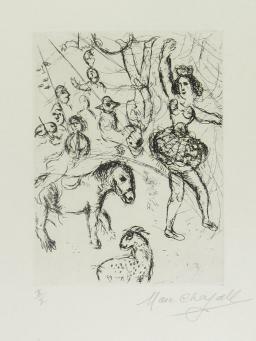 After spending time away from home, Chagall began to increasingly on represent themes of religion, childhood, and fantasy in his work. With the outbreak of WWI, he returned to Vitebsk where he was appointed Commissar of Fine Arts and director of the recently established Free Academy of Art. After participating in the Russian Revolution, Chagall found that his political ideals conflicted with the Soviet System and he returned to Paris. During this period, he was furiously busy writing poetry, publishing articles, writing his memoirs, and of course, painting. His work displays the influence of nearly every contemporary movement, including Cubism, Fauvism and Surrealism, but he consciously avoided and aggressively denied any strict associations with these groups. 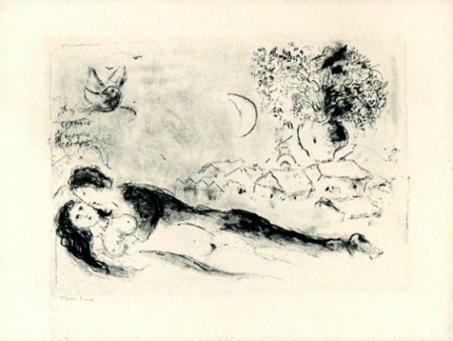 By 1930, Chagall was internationally famous. He worked in nearly every artistic medium and favoured lithographs and book illustration later in his career. He created stained glass windows for the synagogue of the Hadassah Ein Kerem hospital in Jerusalem, and also did The America Windows at the Chicago Institute of Art. 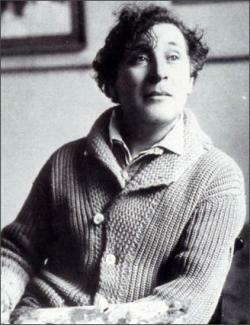 Chagall died in 1985 just as his first major retrospective was closing in Russia. He is one of the few artists to exhibit work at the Louvre in his own lifetime.